Alex Gordon: Top Out Bat Speed By Striding Closed? Question: Does Striding Front Leg Closed Increase OR Decrease Bat Speed? I was taught my whole playing career to stride front foot closed. 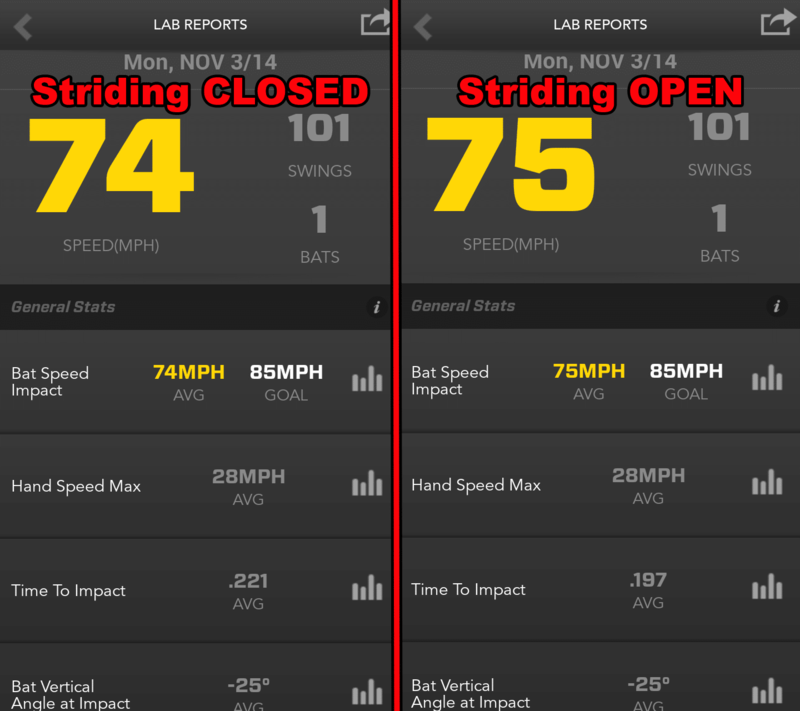 Using the Zepp (Labs) Baseball app , I wanted to use the Scientific Method to analyze whether striding with the front leg closed will have a positive or negative effect on bat speed. Baseball Lessons Video: Better Mechanics, More Drive. Also, CLICK HERE to watch this video from ZenoLink’s Chris Welch on stride principles. Based primarily on my research and study of Dr. Serge Gracovetsky’s book The Spinal Engine , I believe landing with an open front leg – like Alex Gordon – will result in increased bat speed and farther batted ball distance. Landing closed with the front leg – like Kansas City Royals catcher Salvador Perez (who popped out to end the 2014 World Series) – will result in an inefficiency to hitting inside and high pitches. And will allow other compensations to occur such as rolling over, pulling the head, and the front shoulder flying open. 33 inch, 30 ounce Pinnacle Bamboo bat. Swing Study reveals how tens of thousands of hitters are adding 40-feet to batted ball distance by using one simple strategy. Click the button below to access the FREE video that's been downloaded over 30K times!! Striding open with the front leg definitely increased top out bat speed (83-mph v. 81-mph). There was a better chance to maintain higher bat speeds with striding open. During the Alex Gordon Experiment, when striding front leg open, my front foot was at a 45-70 degree angle. I also felt that I had an easier time accelerating the barrel down (towards catcher’s glove) when my stride leg was open, which helped keep my bat speed more consistent. I felt like I had to pull across my body (or chop down) striding with a closed front leg, which made my bat speed more erratic during the first part of the Experiment. I purposely eliminated forward momentum from the Experiment because I wanted to isolate how much striding closed took away from bat speed. In addition, I wanted to preserve accuracy in execution with the two different mechanical scenarios. Spinal engine mechanics drive all human movement, according to Dr. Serge Gracovetsky. When we do things to hinder efficient spinal engine mechanics, reciprocal inhibition takes over depressing a hitter’s ability to maintain higher bat speeds over longer periods. In addition, striding with a closed front leg will cause a hitter to be inefficient getting to inside and higher pitches. A great number of coaches teach hitters to stride with the “front foot closed”. This is the very reason the following compensations occur that these coaches waste their time trying to correct!! Barrel having limited time on the plane of the pitch, which increases mis-hits and strikeouts. 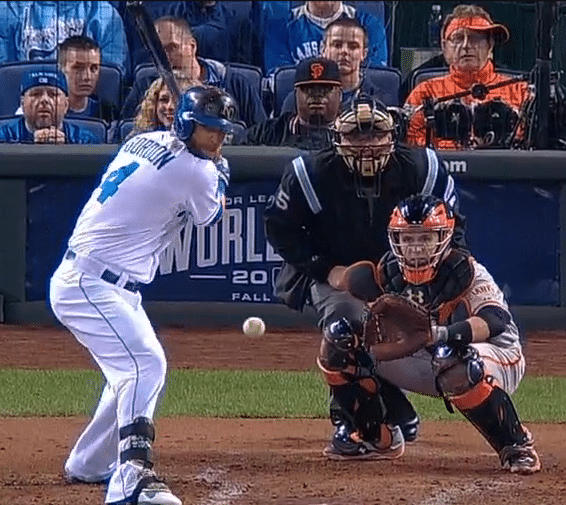 This is why I think Salvador Perez had a hard time handling Madison Bumgarner. 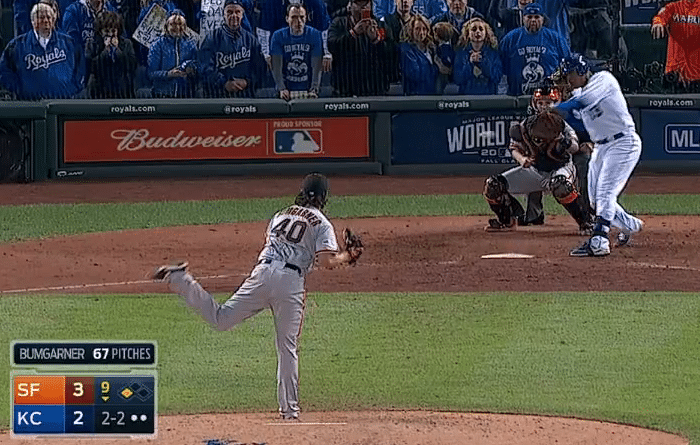 MadBum kept busting him up and in. Because Salvador Perez strides closed I believe this stunted his chances of knocking in Alex Gordon from third at the end of the game. I’m a member of the American Baseball Coaches Association (ABCA), the International Youth and Conditioning Association (IYCA), and the Society for American Baseball Research (SABR).I’m also a HUGE supporter of the Positive Coaching Alliance (PCA). I’ve spent 11+ years in the corrective fitness industry, and have too many alphabet-soup certifications to bore you with.I also played four years of Division One baseball at Fresno State from 2000-2003. It’s NOT how you study, but what you study that counts.I apply human movement principles (or rules), validated by science, to hitting a baseball and softball. Using Batting Weight On-Deck May Dangerous To Bat & Ball Exit Speed? Sadaharu Oh: 5'10" 173-lbs, 868 Dingers Over 22-Years - How? Great post Joey. I am so done with this argument. The jury is out, the verdict is in, and there is no question what so ever that it is both quicker, and more powerful to land with the front foot open. To turn the hips without having the foot pointed forward will cause a deceleration in rotational velocity. There are many places this will happen, most notably in the knee, and with the foot itself digging into the ground. We must not forget that the majority of the force being placed on the ground will be through the front leg. In many cases the back foot is off the ground at contact! With all the players weight and momentum moving through the front side, and that front foot and leg having to rotate against resistance from the ground … well I don’t think we need to go on about this. It’s as plain as day. The one exception may be when the player reads a low outside pitch, and steps down to stay down and in longer to let the ball get deeper. But even on those pitches, he’ll open that foot a little to start rotation. All you have to do is watch the greatest hitter the game has ever seen – Barry Bonds. His foot is turning as he’s striding forward, and his back elbow is in motion before his hips take off as well – but that’s for another discussion. He doesn’t land closed and then try to open/turn as he swings. His foot is open before it even hits the ground – it happens in mid air. You’re right Bob! Thanks for the well articulated comment. I always go back to the German discus throwers that do very well with the “blocking” technique. As they plant the front leg before release, the leg is open, and the whole front side pushes into the ground to amplify spine engine mechanics and springy fascia. Upon follow through these German “blockers” don’t keep spinning around like most other Discus Throwers. They root into the ground, unmovable like a tree. The key is they land with the plant leg open. Check out this YouTube video of German Discus Thrower Robert Harting winning gold in the London 2012 Olympics: https://www.youtube.com/watch?v=Q-96j3T3Dh0 – Love the comments as always Bob! I am not sure what level of baseball you are referring to but in my opinion the player must stride in the same location on every pitch. You don’t have time to stride towards a pitch in a particular area and still be able to catch up to the fastball. As far as the front foot open vs. closed debate… I don’t disagree with you Joey. However, a huge problem with teaching players to land with the front foot open is this allows some players to “pull-off” or fly off the ball. If a player can keep his weight back and his front side closed while still opening the front foot (45 degrees) then I agree with the teaching point. Players who fly open are much more likely to roll over on pitches and also are susceptible to off speed stuff…I totally agree that you can block your front hip better with your front foot open…this is a gymnastic and jumping concept…as a matter of fact the best bat speed might occur if you totally opened the front foot towards the pitcher. That way, the player could completely block and transfer more torque to the lagging bat….But is this what a good baseball coach should teach? I personally would prefer the slightly lower bat speed with the ability to react to an off-speed pitch because the player is in a fundamentally sound and closed position. I totally hear you on the front shoulder flying open problem. But we have to understand as instructors that this could be a root result of landing closed with the front leg. If we block the pelvis from opening, then the brain has to delegate the shoulder to open sooner, in order to get the barrel to the ball. If this is the case, then getting a hitter to stride open, we need to teach them to “block” their shoulders from opening till as close to the Fight Position (landing) as possible. The pelvis can fly open before even the front foot hits the ground, but the front shoulder MUST stay in and down towards the back hip to have any kind of consistent power. This is how Hank Aaron did what he did hitting out on his front foot so much. He kept the spring loaded. I may do a video on just the front shoulder flying open. Thanks again Dave for the comment and question! I may not have articulated the point well enough, but I’m not suggesting the player put his foot down in a different spot for various pitches. The discussion is around opening or closing the foot, and there is no question that striding power hitters will open their front foot more on an inside pitch than they will on an outside pitch. The foot comes down in the same spot either way, but if you watch stride hitters for this, you’ll see that they are in motion toward the ball as the pitch is coming in. Their front foot is not down yet, and they have already identified pitch location. That’s how they know to wait on and outside pitch or jump on something inside. From the time they lift their foot, through the stride, and then to plant, there most definitely is time to make the decision (if you can call it that), on how much to open the front foot – because the foot makes it’s last bit of rotation explosively right before heel plant. If the pitch is outside, they will have their foot a little more closed by not making that final, dramatic turn – and their weight can be distributed more in the middle to instep of that front foot. This will leave them in a posture to direct their mid-line to the point of contact. And if it’s an inside pitch … they will open a bit more and get their weight more on the heel and outside of the foot. The front shoulder stays in a little longer outside (because they’re letting the ball come to them), and they stay a little lower as well by not pulling up as much from the waist. That way they can swing more level and keep the sweet spot on target and not reach for the ball. If a hitter doesn’t have time to do this … they are either not picking up the ball at it’s release point … getting their foot down too early, and/or starting their actual swing (moving the bat) too late. When I think of hitting, I always think maximum power first. I don’t tell hitters to slow their bat down. I like too see them start the bat in motion as the front elbow drops in, and that is right before foot plant. That way they don’t diffuse energy from their forward momentum, but instead use that in the rotational phase of the swing. It also shortens the swing in terms of time from launch to contact. I like to see the foot down later, and the bat as close behind it as possible – as opposed to getting the foot down … allowing a slight pause/stopping motion … and then starting the bat. Having that approach allows the player to get set and make calculations before they commit entirely. If you step down early, slow the bat down, and decide at the last instant, you’ll be guessing, and at the mercy of the pitcher. Not only that, having to make all necessary adjustments to pitch location with primarily your arms means that you are not swinging at your max. That’s how guys whiff on outside pitches. Think of it this way … when you go up to the plate you can be like the fisherman, or the hunter. The fisherman gets into his little boat and goes out on the lake with his pole, and he doesn’t have a clue if there are any fish out there or not. He puts his hook in and waits … and he may get a bite – or maybe not! The hunter on the other hand goes out and stocks his prey and kills it. The moral of course is that if you prepare your mind to execute later in the pitch flight, you can hunt the pitch and go after it aggressively. It goes to show how a hitters approach and mindset affects his technique, and visa versa. Bravo Bob! This would be another great article to write on for you 🙂 By the way, I use your fisherman and hunter metaphor all the time with my hitters now. Bob and Joey…first off let me say I love the conversation. Hitting is so challenging and complex…we as coaches can choose how we teach these concepts to our athletes but rarely would I ever be able to delve into the deeper aspects of the swing with them. Any ground based sport that involves a rotation and sequential unlocking of the joints through the spine (golf, tennis, discus, shot put, hammer throw, javelin…etc) would be open to coaches having this discussion. My list included only sports that had an implement involved however gymnastics, diving and any jumping sport would also find coaches talking about the importance of concepts such as blocking the front hip and triple extension. With that being said I think the demands of each sport require coaches to be careful about applying rotational concepts broadly. For example, throwing a javelin and throwing a baseball are completely different animals. Some basic principles are the same but we wouldn’t coach them the same….Agree? Power and Bat speed are totally different concepts in my opinion…You can have great Power and slow bat speed…opposite is true….we’ve all seen guys with amazingly quick bats but no pop at all…..I have always thought about Bat Speed as the time it takes a hitter to get point A to Point B….Point A is when we see first positive movement of the swing and Point B is contact….I have seen some guys who had long swings but could absolutely crush a baseball…I have seen little guys who were super short from A to B but could barely hit the ball over the short stop…. Dave, you’re right, human movement principles are found in every explosive rotational athlete. The methods, or way of getting to the desired outcome, may change. But Gravitational Forces, Conserving Linear into Angular momentum, and spinal engine mechanics always hold true, whether its tennis or pitching. We just have to see how they fit into hitting. As for the front foot question, I believe in teaching big pieces and not small parts. The brain doesn’t think in small parts (like what a foot is doing). It wants to lunge, squat, push, pull, hinge, and twist. So I think in terms of opening the front leg, not the foot. AND, the lower half can open prematurely (Bautista and Donaldson both do this), even on breaking and off speed…the key is blocking the shoulders from opening too soon. “Showing the pitcher your numbers” and “block your shoulders” are cues the brain understands very well. Dave, you’re also right about bat speed v. power. Actually when you look at the law of Conserving Linear into Angular Momentum (the science of turning), you’ll find both. To increase turning speed a person brings arms and legs into center-line, to slow rotational velocity down, the arms go out (think ice skater). Angular velocity and inertial mass (force) have an inverse relationship. When turning speed is maximized, inertial mass is almost zero. When inertial mass is maximized, turning speed is almost zero. Since hitters are attempting to hit an unknown pitch, they must increase turning speed by staying tight until the barrel approaches pitch plane. Then the hitter starts extending the front arm to contact, and the back arm passed contact. Another way to describe it is Centripetal Forces giving way to Centrifugal Forces. It’s swinging a rock attached to a string in a circle (centripetal force), and then letting the rock go while still in motion (centrifugal force). A hitter that is purely rotational, always has a bend in the arms to and through contact (i.e. Derek Jeter) WILL NOT transfer the inertial force necessary to crush the ball a long way. Jeter didn’t know how to increase his power, and this was one of a couple ways he could have. I hope this explanation helps Dave. Great thoughts and discussion. I do teach my hitters the science. Even though they may not understand it right away, I plant the seed. It’s no different than the new things they’re being taught in class. I think there needs to be a healthy combination of sticky coaching cues and the hard science when we teach. Some interesting points boys. Thanks for your sharing them. What a great discussion. I’m going to ruffle some feathers by saying this … but the way I see it … there is no way the hips lead the way in any high level baseball swing. The back elbow moves first (usually in unison with the back knee), and the bat has to go with it. If you don’t bring the bat with your elbow slotting in, you have to collapse your back side. It’s like a rear end car crash where your back side collides with the front. Also key is that the top half must rotate as the elbow drops down or the back arm will not have a clear path through to contact without having to make compensations – simply because it will come into contact with the back hip. So rotation of the top half has to begin at/as/before foot plant (or from the time between toe touch and the heel coming down) to accommodate the backside upper half’s movement forward. Just watch any pro hitter in slow mo and mark where their toe comes down, then run it until heel plant, and you will see the back elbow starting down and the bat will be going with it over the course of that time. At the same time … mark the belt buckle at toe touch and you will see very little, if any movement from there to heel plant. Baseball coaches talk about separation and bat lag like it is something that is desirable, and even practise it – but that is not what happens in real time. The reason the toe opens is not to clear the hips, it’s to help with the uninhibited rotation of the torso, which is exponentially more critical to a high level swing than the turning of the hips. The bat head moves a total distance of between 7 and 8 feet for an adult. The hips move about one foot – or less! They must cover this distance in the same amount of time. Too many coaches teach their players to land their foot, turn their hips, drop the elbow in, and then rotate to contact keeping the arms in a relatively stagnant angle throughout rotation – then extend after contact. This is not how pros swing. High level power hitters begin to uncoil the top half as they are moving forward. Then they start to drop the elbow, and the bat, between toe and heel plant, and as they do that, their upper torso comes back to neutral (don’t forget they are ‘over-rotated’ toward the catcher). Then as the heel is coming down, the hips go with it … the front side halts … and from there on it’s pure upper body activity to contact. The part the hips play is actually quite minor – relative to the upper torso and arms. Watch this clip of Pujols and mark his back elbow. Measure it against the roof of the dugout. At about 8.5, and at 9 for sure … hit the pause and you will see that his foot is not down yet and it is turning, and his back elbow is moving. His foot lands open at 10 and his hips are still in about the same place, but his upper half is well into it’s movement. Watch that very very closely fellas. Watch how right before he comes down his foot opens, and how the bat and his whole top half is already engaged by then – and his hips haven’t budged. Not every hitter does it exactly like this, but this is the future of hitting. Albert was always known as a ‘no stride’ hitter, but he’s changed that to this swing now. The issue of committing the bat (top half) too early is not as simple as it seems. Essentially we’re talking about time. Time can be lost, made up, etc. by various factors – some of them are in the ‘Approach’ column, and some come under the heading of ‘Technique’. Players construct a combination of these two things … They alter/adapt techniques that will allow them to execute according to their approach, or they will devise an approach based on the limits and parameters of their technique. Let’s say for instance that a player can manufacture a bat speed of 80 miles an hour. If the distance the bat has to travel from it’s launch position (LP) to it’s point of contact (POC) is 8 feet, and the pitch is coming in at 80 miles an hour, then theoretically they should launch the bat when the ball is 8 feet away from the POC. Here’s where it gets dicey. The calculations for variances in this simple equation are endless, because there is a X factor in bat speed. Also … and you guys get the point I’m making by now, but the whole when-to-launch-the-bat issue is always going to be reactionary because of the ball speed, and because it has to travel that distance in a determined amount of time, depending on the players technique. It’s a tricky issue to nail down, because so many things can happen during this process, and we could compile a long list – but here’s the bottom line … The bat head has to travel X distance in Y time. Starting early means that if a player can swing at 80 MPH and starts his swing when the ball is 10 or 12 feet away from the POC on an 80 MPH pitch, he’ll be early! Again … and only giving one of the dozens of possible examples … to make contact in this instance he can slow the bat down to 75 MPH. This is an alteration to his technique and will affect the outcome, because a bat speed of 75 won’t produce the same distance of hit as a bat speed of 80 – all other things being equal. Having said all that … one reason I can say that hitting a baseball is primarily an upper body dominant skill, is by looking at the athletes themselves, and how they train. The body type of a sprinter (and we’re talking world class here) is characterized by a much more developed and trained lower half – as is with a cyclist, soccer, player, etc. If you look at baseball players, the best hitters have more advanced mass and strength in the hands, wrists, forearms, biceps, shoulders, back, and chest. They all have above average strength in general, but if they don’t have naturally large calf muscles, thighs, and butts, they don’t spend the off season strengthening and bulking up that part of their body the way Walter Payton did. Mark McGuire didn’t have nearly the proportion of leg power of Earl Campbell – nor did he need it or try to develop it. But he had tremendous arm, and upper torso strength – which he developed continually. Simple hand strength itself is a big reason one player can hit a ball harder than another with the same bat speed. So swinging too early could be a factor of getting the foot down too soon, or a number of other things. And to answer your question about teaching points … the player has to have a ‘Model of Excellence’ – so they have to know where they want to be. Then they have to see where they are. The things they need to do to get there can then be easily identified, and then they need to know why (cause and effect) various things happen, or don’t happen. Lastly … they need to see it, by watching themselves (or in our case looking at a mirror) and especially feel it. Great discussion. I have looked at the videos posted by Joey on Hank Aaron, Mickey Mantle, Lou Gehrig and Babe Ruth. They all open the foot at contact. Pitchers open the foot even more, and they do this to start the hips opening. I don’t know how relevant this is as they are linear, rotation and then linear again in their movements and to be able to move properly over the foot, the line of progression can be either between the 1st and second toes or the 3rd and 4th toes. That being said, it makes no sense to have the hip joint restrict rotation of the pelvis above. Just watch the foot of some ball players at the end of the swing and how it rapidly twists in relation to the ground. That is the lost force of rotation showing itself. Great point Doc. It’s funny how ignorant people are about this. I got blown up on Facebook about this very topic. Saying that any Major League hitter will have trouble turning on a 95+mph fastball (we were talking about Bumgarner pitching Salvador Perez in – who lands closed off btw)…and I said, then why close the front side and take away any chance the hitter may have?? People don’t understand that smart pitchers are pitching hitters, the way they are, because of inefficient swing mechanics. If you’re a hitter who believes your stride leg should be closed at landing, you’re putting yourself at a major disadvantage. I think so Djura. The big thing is that at landing we looking at the foot to be open at 65-degrees. That doesn’t block the pelvis off from rotating. Once GRF’s begin, that pelvis better be ready to fire or else the hitter will be ineffective on the inside and upper parts of the strike zone. I agree with you 100% that teaching the student to adjust his foot direction according to pitch location is not something that is realistic to teach. Hitting is tough enough as it is. They can however land in a consistent area or direction and land that front foot at say 45 to 60 degrees open. In the beginning of all my lessons, I get my hitters to land in the perfect launch position and hold that position while I adjust spine angle and a scapular load with the back elbow with a downward and inward shoulder rotation. What I didn’t tell you is that I measure their hand and barrel speeds, launch angles, and time to contact prior to teaching the launch position and 99% of the time, that student makes substantial gains in all areas. What I typically see in a closed foot landing is the upper half or the shoulders and hands firing first which sequencially alters the Swing. Usually directional force is altered and handpath to contact gets around to the outside too much. An early separation of hands and shoulders. The swing may be quick but little force is generated with slow barrel speeds. And back to one of your earlier bloggers. Batspeed is power. If a person swings a 30 oz bat 70 MPH, considerable force is generated. Those small guys that were referenced to obviously didn’t swing at those speeds or the ball would be flying. My son is 5’9, 175 lbs and is not a big guy but swings his Barrel around 90 mph and his front foot is open and the ball takes off. I look forward to our next conversation. Take care Joey. You said that striding closed is bad but jose altuve does it and has pretty good success. What are your thoughts? Since this post, I’ve actually warmed up to closing off. Giancarlo Stanton’s turnaround a couple years ago as an example. Grab Our Amazon Best Seller! I use the system to teach my son and he is 4’11 67 pound 10 year old. Meaning he is super skinny and very tall. He hit one in tryouts yesterday 250 in the air. I was in center field shagging balls. It’s real. It happens. Thank you Coach! Your stuff is great! My son got his first home run 2 weeks after reading your book. Keeps getting more and more distance now.